This year’s running of the 141st Travers Stakes at Saratoga has drawn a large and contentious field of 11 three-year-olds. Because Preakness and Haskell winner Lookin at Lucky is notably absent from this group, bettors have been left scratching their heads as to who should be the deserving favorite. This fact alone will make the Travers a great betting race with several overlay possibilities. Here are a few real contenders that have a legitimate shot at winning the Travers. A Little Warm, has been made the lukewarm (no pun intended) 7-2 morning line favorite by NYRA racing secretary Eric Donovan. After missing all of the Triple Crown races, A Little Warm burst onto the three year old scene after flashing a 61+ WinningPonies rating in an optional claimer at Delaware Park, followed up with a win in the Jim Dandy at Saratoga. A Little Warm will be facing four others in this spot that he beat in the Jim Dandy back in July. In that race A Little Warm was able to rate just off of a front running Miner’s Reserve, who at 15-1, outran his odds to finish second. Trappe Shot finished a strong second to Lookin at Lucky last time out in the Haskell and has since been training very strongly. He has never raced at a classic distance, and only at the last minute, his connections decided to run him here, rather than in the Kings Bishop at 7 furlongs. Trappe Shot could be very dangerous if he is still improving at a similar rate. He has been assigned odds of 4-1 on the morning line. Fly Down, who finished a disappointing fifth as the favorite in the Jim Dandy, is 8-1 on the morning line. Let’s not forget that Fly Down finished a strong second in the Belmont and is a proven distance runner. Also, his Jim Dandy performance was much better than his out of the money finish indicates. After racing at the back of the pack until the final furlong, he tried to make a move going into the stretch, but after he split horses was checked sharply and got stopped in traffic. With the right trip, Fly Down could win at a nice price. For the first time, the NYRA will be offering a special double wager linking the Travers on Saturday, August 28th with the Personal Ensign, featuring Rachel Alexandra to be run the next day. The Travers is also the last leg of a $1,000,000 guaranteed Pick-4, so even if the chalk horses win, the payout should be more than generous. 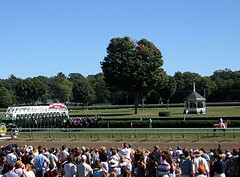 Pick up our Saratoga cards this weekend and take down this Pick-4 and special 2-day double!